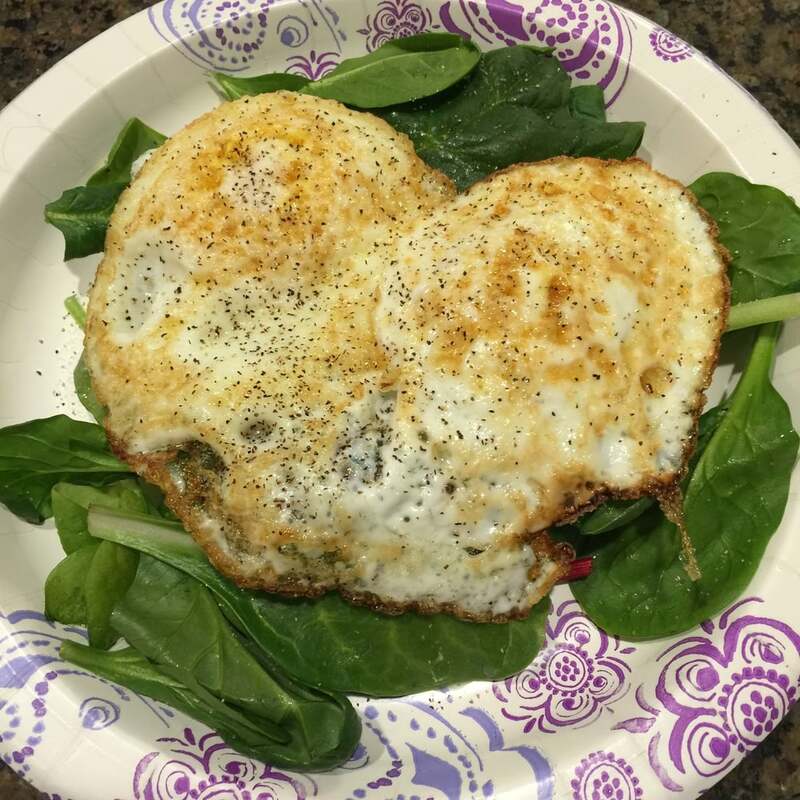 #Whole30 Days 8 and 9 — MommiesRun. There was a moment on Monday where I did not think I would still be posting my daily Whole30 eats. But lucky for you I'm still on board thanks to a pep talk from Tara. I guess I can say that I learned that stress is a trigger for me to want to chow down on non-Good Food. I might have told her that I wanted to face plant into a cupcake. Somehow I survived that breakdown and had a snack of raw cashews to tide me over until dinner. Lesson learned: Avoid stressful situations. Haha just kidding, I'm a pharmacist and it's January...there's no way to avoid that situation! Monday morning I was in a rush to get the girls ready for school and get myself fed so I had my old standby: eggs and power greens plus some coffee with almond milk. One might think I'd be bored with eggs, but they'd be wrong. I literally wake up excited to eat my eggs! Have I said that before? For lunch I made a salad of power greens with carrots, raspberries, and walnuts. I also cooked some salmon in the microwave and put that in the salad along with a drizzle of Tessemae's Lemon Garlic dressing which is OMG AMAZING. For dinner I made a family favorite: Stuffed Pepper Soup with a salad. While the family had rice in their soup, I skipped it, and it tasted just as good. I will admit I would have liked some rice just because but I was fine without it. I topped the salad with some cucumbers, olives, and more Tessemae's. During the day I snacked on an apple and raw cashews and I had some tea at bedtime. Like I mentioned at the start of this post, it was a stressful day at work for me. That stress made me crave things I don't need, things that besides not being Whole30 approved are things that will end up making me feel worse. I'm glad I survived that storm, and more importantly I proved to myself that I'm stronger than a craving. Last week before my long run I tried this as my breakfast and it seemed to work well, so I went with it again. 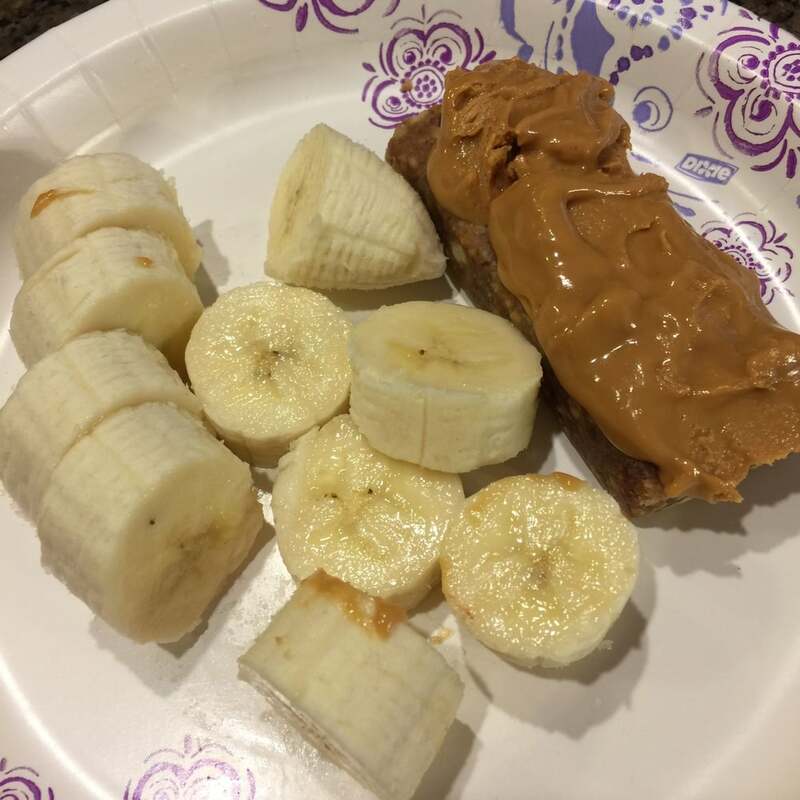 A banana, LaraBar and almond butter is a great pre run breakfast when you can't stomach veggies before a run, like me. Right after my run I ate some orange slices that I had brought with me, but then I headed home to get some protein. In all honesty, I wasn't hungry. I felt fine, great actually, after my run, but just not hungry. I knew I needed to eat though so I had some eggs, guacamole, and carrots. A new Five Guys opened in our area and I decided to try their bunless burger. I still wasn't hungry for some reason so this size really was perfect for me. While this might have been a little out of the Whole30 zone, everything I could find in their nutritional information showed that there was no sugar, soy, grains, etc in the burger. So I went with it, and it was good! I don't know what my deal was, but I just wasn't hungry all day. This is really weird for me because I'm hungry like all the time. And I even ran 10 miles! Hopefully I'm not getting sick or anything. Well, I'm pretty much a third of the way though now! I'm hopeful that I'll be able to stay strong for the rest of the 30 days. Please let me know if you have any questions about my journey so far. I plan on having a post later this week about my running while on Whole30. Also, check out my friend Margaret's blog post about what she ate in a day: girlfriend knows how to cook good food and take amazing pictures!